GEORGIA: Pastor Who Said Pulse Victims "Got What They Deserved" Arrested For Child Molestation - Joe.My.God. A Georgia pastor and and conservative political activist was arrested Friday morning on charges of child molestation and aggravated child molestation. Ken Adkins, 56, of St. Simons Island turned himself into police at about 9 a.m., according to officials with Georgia Bureau of Investigation. GBI was requested on Aug. 12 to assist officials with the accusations against Adkins. Adkins is currently in the Glynn County Jail. The investigation is ongoing. Adkins has one church with locations in Brunswick, Jacksonville and Atlanta, according to his website. 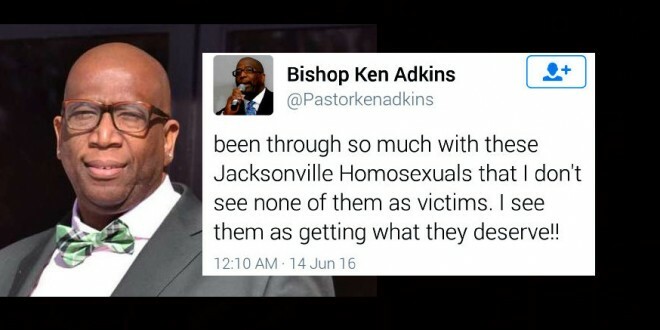 Adkins recently came under fire when he tweeted “homosexuals got what they deserved” after the deadly mass shooting at Pulse Nightclub. His Twitter account has been set to private.